Hi Jonni, thank you for your reply. I am trying again to send the photo. Hello Jonni, how are you? I hope it’s not too cold in your area. 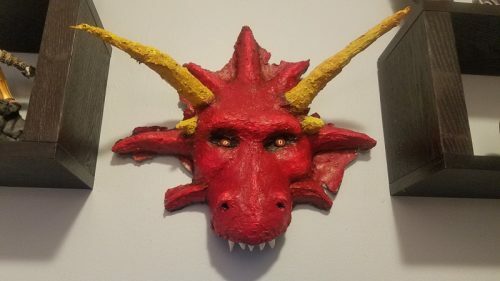 I wanted to send a photo of my project, using your paper Mache recipe but I don’t know how. Hi Miki. All photos added to the site need to be less than 250 kb, and most cameras are set to save images at huge file sizes. To make them smaller, you can use an image editing program on your device, or use this free online tool. We’d love to see your project, so I hope you’ll try again. And yes, it got a little ‘chilly’ here in Minnesota – it was -35° one morning when I got up – but it’s warmed up now. I think the Northeast is getting hit with the cold weather now. Stay warm, everyone! oh….the picture didn’t load. Must be too big. 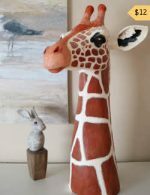 Hi Jonni….I thought you’ d like to know that I’m constantly being asked how I got started with papier mache sculpting and how I make my papier mache clay. The answer to both questions is ‘have a look at Jonni Good’s website! 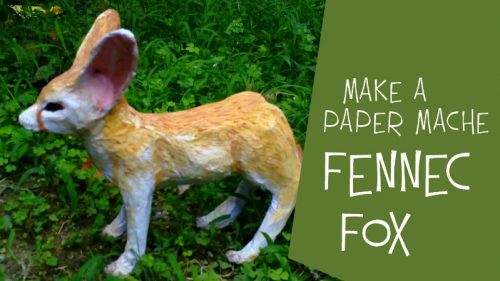 It was her who inspired me to start using papier mache and it is her recipe that I use for every piece I make!’. It’s true!! Here’s a picture of a recent commissioned portrait. I hope you like it! Hi Debbie. I’m so glad you’re telling folks about the site. Thanks! And yes, the image didn’t come through. Can you make it smaller and try again? We’d love to see that portrait. 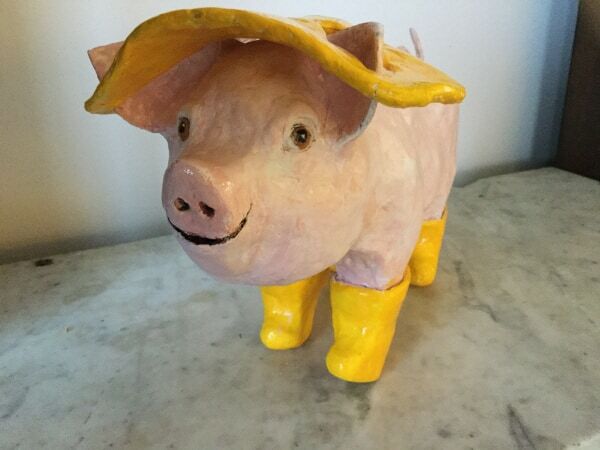 Not long befor Christmas my grandson asked if I could make a pig in boots for his girlfriend. I didn’t have much time but fortunat Oy r mmber r Jonni’s excellent pig pattern which was a great help. Thanks for your suggestions… I love your work and channel.. I have a collection of Brown Bag Cookie Art Molds that I would like to use with your paper mache clay recipe. What do I need to do to get the clay to release from the mold without messing up any of the details in the mold? The molds are clay and do not bend. Hi Tammy. The usual rule of thumb is that you use a flexible mold to create solid castings, and a solid mold to create flexible castings. 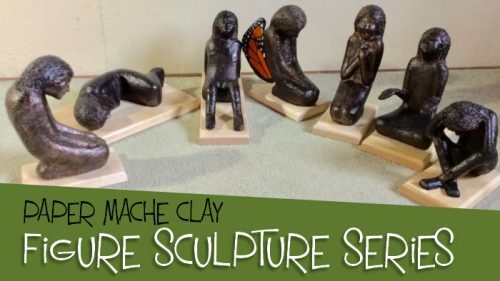 I can’t imagine how you would ever get the dried paper mache clay out of a solid clay mold, even if you do use a release. You’d have to use a knife or something to pry them out. And if you add a release, the oil will seep into the clay and you may not be able to use them again. But perhaps one of our readers knows how to make it work. Good luck with it! I have used a sheet of plastic wrap placed over the mold, push the paper clay into the mold let it set up a bit before lifting the plastic wrap out. It works well. If I botch it I either fix it with a paintbrush or redo. Attached photo of front view, in the process of adding more mane to the sides. Thank you for sharing, The lion is beautiful great work! Would love to write a guest post, unfortunately I just got stuck in and did not take photo’s of all the process. 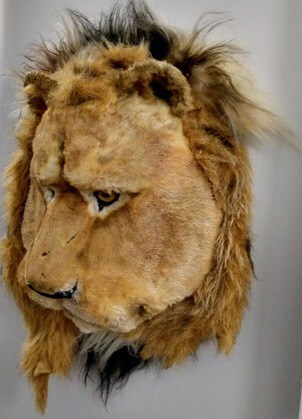 However I am thinking of doing another one, of a tigers head that would be furred in the near future. Firstly though I have a couple of sculptures to do, one a gorilla made from old cycle tyres. When you do have time, just let me know. 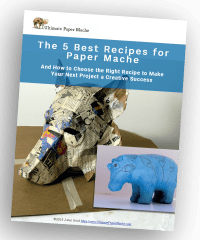 We would love to see that gorilla, too – we like all kinds of art, whether paper mache is involved or not. 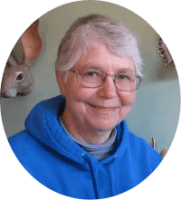 Do you sell your sculptures? Not to long before i bought The pattern of the unicorn but he is not able to stand on his legs . i do not know what is the epoxy that i need and instead i put paper with glue as cALld paper mache and the unicorn became very heavy and now i took off all the paper and i must wait until all what i have done until i put then paPER TO DRY, DO YOU HAVE ANOTHER NAME FOR EPOXY CLAY, I AM RESIDENT OF ISRAEL I COULD NOT FOUND THIS PRODUCT. THANK YOU, CAN YOU HELP ME PLEASE? Hi Tamar. It’s possible that Apoxy Sculpt is not available in Israel. You can see what the containers look like on the US Amazon store here. 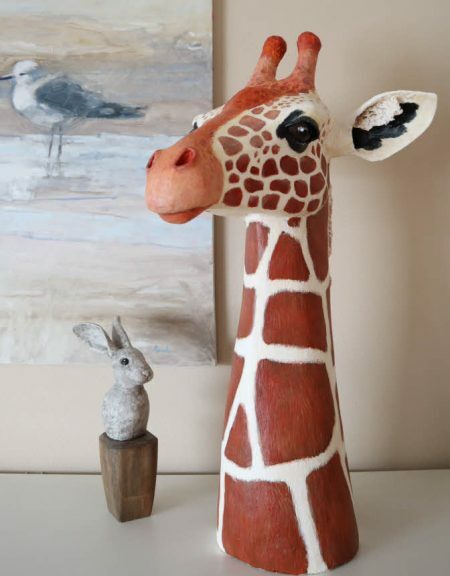 There are two tricks for getting a thin-legged sculpture to stand up when adding paper mache. First, use a piece of fairly strong wire on the inside of the leg. It will help support the weight of the wet paper. Second, add paper mache to the legs only, and let it dry. 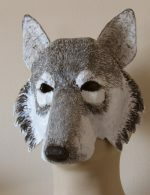 This will also add support for the paper mache you put on the body. You might also want to limit the number of layers on the body, to keep the weight down. I hope this helps. 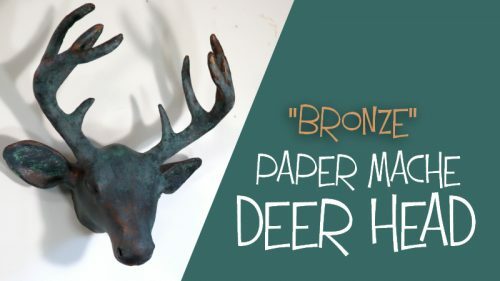 Me encanto .me gusta ver como se puede ulitizar muchas manualidades en cusnto como lo utilizaste para hacer esos bellos animales .me gudto varios como el elefante zorro vaca y hipopotamo. Como me gustaria y aprender paso a paso las bellezas que hace .te felicito por darnos la oportunidad de aprender y reciclar nuestros periódicos. Thank you .welcome. We are a group of moms making masks for our kid’s school show the Lion King. Thankfully I found your website and your patterns and tutorials are great. 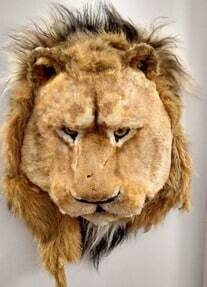 Here is a picture of my first lion’s head. Only 11 more to go. Then the elephant and hyenas. Whew! Hi Shellee. 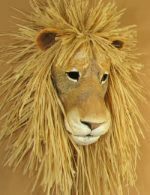 We would love to see your lion’s head. I know you tried to upload a photo, but it didn’t work. That’s usually because the image file is too big. This online resizer should work to make it small enough to post (249 kb or less). I do hope you’ll give it another try! I use polystyrene wig stands to build heads on. If you have a dremel or similar or 80 grit sand paper you can modify it to take eyeballs (table tennis balls for the Halloween stuff) or just to modify the shape to suit. I shred pages from old paperback books, soak the shreds in hot water for a couple of hours, blitz with a hand blender, drain and add white glue for a base mixture for roughing out and finish with paper clay. Hi Liam. 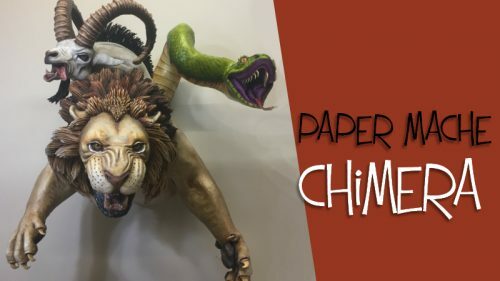 Your paper mache heads sound interesting. Do you have any photos of them you’d like to share? Not sure if I’m doing this correctly but here’s a selection of my efforts. I’ve only been doing this for just over a year so all advise and or tips are gratefully accepted. Hi. 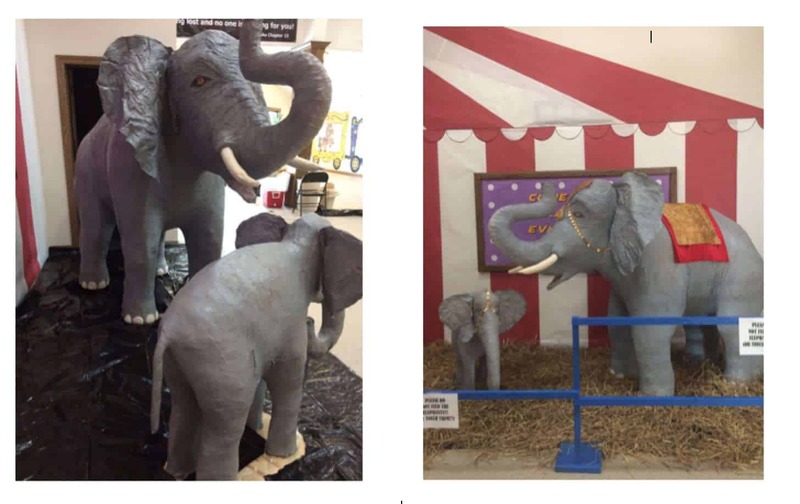 I was wanting to make an elephant for a circus VBS theme we were doing at our church and I ran across your Youtube tutorial. I decided to give it a try. After cutting out the pattern for the small elephant, I decided to try a large elephant. I made your pattern 3 times larger, and got lots and lots of paper and tape for the stuffing! After assembling the spacers for the smaller elephant, I found it to still be tipsy, so I attached it to a base. I decided to make the spacers for the large elephant a little more sturdy, and a little wider, which made it a little tricky with filling out the legs to look realistic, but I got it and it is sturdy. I took several pictures of the process but am uploading the final product. Thanks for the tutorial! Everyone loved them! It’s fantastic! Your ideas for making the large elephant more stable are great. Would you have any interest in writing a guest post for us, to show us those progress photos along with the end result? If so, just let me know and I’ll send an email that explains the process. 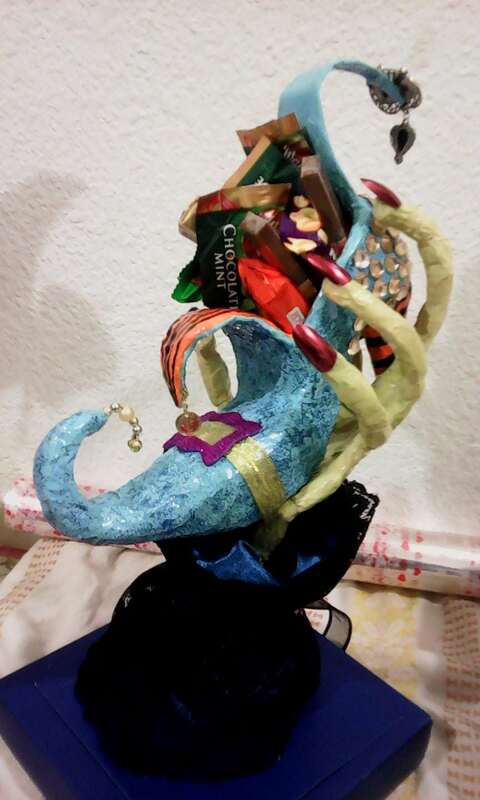 Thanks so much for sharing your elephant with us! 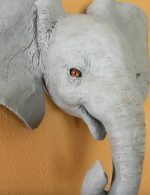 Hi Joni, using your baby elephant tutorial, my friends and I were able to make a life size dog statue (the white dog from the tv show FRIENDS) I keep trying to post a picture but it’s too large to upload. Hi Robin. We would love to see the dog you made. You can make the image smaller using this free online image resizer. And I also can’t wait to see that rhino! Have fun with it. Thanks, Jessie. What an interesting idea! I have a Very old baby doll with a disfigured face. She is broken in several places but she is cute! Wondering if i could mould this to reconstruct her mouth, and give her a forearm and hand…. Hi Cherri. You might like to see this guest post about restoring an antique doll. Karen used my paper mache clay recipe, plus a wood filler product, to replace the legs on her doll. Another option that might work if you need really fine details on the mouth would be to use Apoxie Sculpt, because it’s a little easier to make it smooth, and it’s easier to get those fine details. 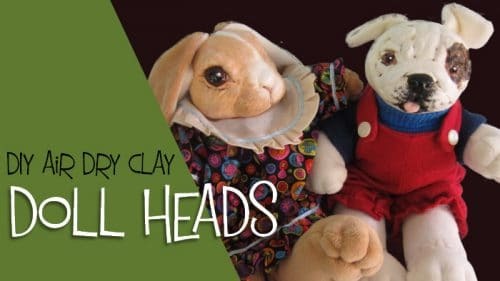 I haven’t tried either method myself, though – and you’d want to experiment on something that isn’t as precious as your doll before deciding how to reconstruct it. Hi Jill. I checked the Gumroad records, and it looks like they sent the email but it hasn’t yet been opened. I asked them to resend it. Did you check your spam filter? If you don’t find the new one, please let me know. It also looks like you might have an existing account with Gumroad using the same email address. If you still have your password I think you can sign into your account and find the download link there.